U.S. President Donald Trump, left, and German Chancellor Angela Merkel are seen at the panel discussion of the Women's Entrepreneur Finance event on the second day of the G-20 summit in Hamburg, Germany, July 8, 2017. The G-20 summit of the leaders of the world’s richest economies wrapped up Saturday in the German city of Hamburg against a backdrop of angry protests and with U.S. President Donald Trump taking center stage. President Trump’s schedule on the last day of the summit included a series of meetings on the sidelines with the leaders of Britain, Indonesia, Singapore, Japan, and China. At a women entrepreneurs finance session, the U.S. president offered a conciliatory gesture to the summit’s host, German Chancellor Angela Merkel, perhaps the most vocal critic among G-20 leaders of Trump’s policies on trade and climate. 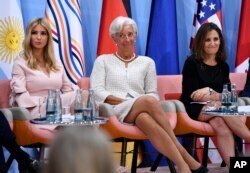 The daughter of the U.S. president, Ivanka Trump, IMF Managing Director Christine Lagarde and Canada's Minister of Foreign Affairs Chrystia Freeland attend the Women's Entrepreneurship Finance event at the G-20 Summit in Hamburg, Germany, July 8, 2017. 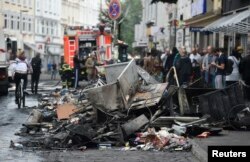 Trump praised Merkel for the job her country has done in hosting the summit despite unrelenting anti-capitalist protests that escalated in Hamburg Saturday and included car burnings and the looting of businesses. “It's been really incredible the way things have been handled and nothing's easy, but so professionally, without much interruption despite quite a few people and they seem to follow your G20s around,” President Trump told Merkel. “But you have been amazing and you have done a fantastic job and thank you very much, chancellor. Bravo,” the U.S. leader said. German officials had expected 100,000 protesters Saturday on the streets of Hamburg. Damage is seen on a street after demonstrations at the G-20 summit in Hamburg, Germany, July 8, 2017. Trump’s last meeting of the day was with Chinese President Xi Jinping, with whom he had been expected to raise the tough issues of North Korea and Chinese steel dumping. Trump has criticized the Chinese leadership for failing to use its influence on the otherwise isolated North and getting it to stop its missile tests. The U.S. president and his entourage left Hamburg immediately after meeting with Xi. Briefing reporters aboard Air Force One, a U.S. official described Trump’s meeting as “substantive” and said the conversation had focused on North Korea and U.S.-Chinese military and security cooperation. The official said Trump and Xi talked about ways to "deal with North Korea together." It was Trump’s meeting with Russian President Vladimir Putin a day earlier that made headlines at the two-day summit. The two men had a visibly warm encounter that went for more than two hours - far longer than expected to the point where Trump had to push a previously scheduled meeting with British Prime Minister Theresa May to Saturday. Despite the friendly tone of Trump’s meeting with Putin Friday, Secretary of State Rex Tillerson said the U.S. leader had pressed Putin repeatedly on allegations that Russia meddled in U.S. elections last year. The Russians denied any interference in the U.S. electoral process. "President Trump said that he heard firm assertions from President Putin that it is not true and that Russian authorities have not meddled in these elections and that [Trump] said that he accepts these assertions. That's it," said Russian Foreign Minister Sergei Lavrov. At the end of the summit, Putin told reporters they should ask Trump the question of whether the U.S. leader believed Putin’s assertions or not. “You have to ask about President Trump’s attitude to my answers and not what happened. Nothing was happening. We weren’t meddling [in the election],” Putin said. U.S. officials have not confirmed Lavrov’s characterization of President Trump’s response to Putin. Whether the meeting represents similar gains for President Trump remains a question. The leaders attending the G-20 summit in Hamburg, Germany, pose for a photo, July 7, 2017. ​The U.S. leader appeared to focus entirely on the relationships and issues he values and not concentrate on the issues that are of less interest to him. During the summit he made no significant mention of climate change, a topic that Merkel and others said they would prioritize in the wake of Trump’s decision to pull the U.S. out of the Paris climate accord. Trump and May talked about their post-Brexit relations, an especially significant theme at a time when Trump’s America First policy and Britain’s decision to break from the EU give the two historic allies even more reason to bond. “There is no country that could possibly be closer than our countries and for a long time,” Trump said. “We're working on a trade deal that will be a very, very big deal, very powerful deal, great for both countries, and I think we'll have that done very, very quickly. Trump told reporters he “will be going to London” but the date still needs to be worked out.